Imagine 2.5 million wild animals grazing and suddenly making the “wildness trumpet” in a chorus of sound signaling it is time for the herd to move on. When they do, they walk or run in single file line for over 600 miles. 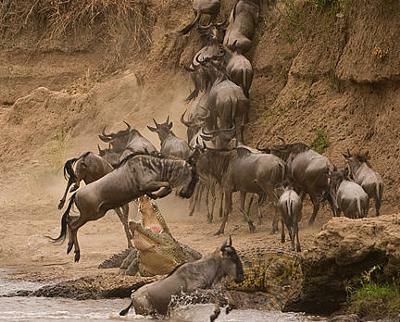 En route they are in a panic as they prepare to cross the Grumeti River that is swollen with turbulent crocodile filled rushing waters in the western Serengeti region during June-July. Up to 250,000 animals become meals for the crocodiles at this time. The survivors of the herd migrate northwards into the Maasai Mara in August-September where they must attempt crossing the Mara River which is also filled with hungry crocodiles. 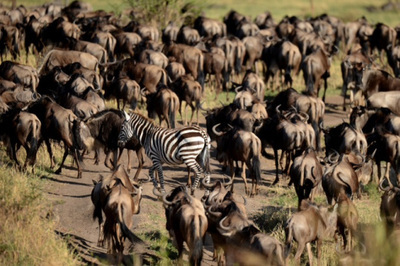 Different animals within the Great Migration play different roles. Though wildebeest constitute the majority of the animals, the zebra leads the way as they have a superior memory of where they passed the previous year. Their natural instincts and memory are the survival mechanism for the entire herd. The Great Migration is one of the natural wonders of the world in which 2.5 million wildebeest, zebras, antelopes, gazelles and other animals rotate in a circular clockwise movement en masse from month-to-month from one area in the Serengeti to another over 600 miles annually. 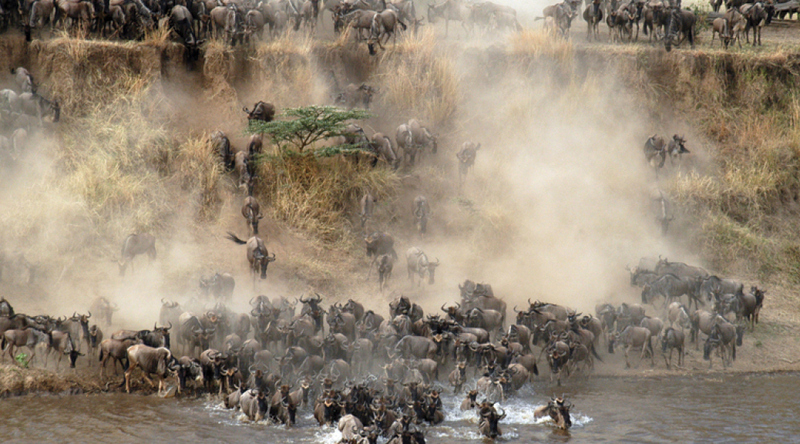 Great Migration tours are the greatest animal show on earth and one of its most uniquely distinctive patterns of animal migrations to be found. This is the result of the confluence of a wide open plain of fertile volcanic soil that produces highly concentrated phosphorus low grasses the wildebeest need to eat to survive and a water pattern animals migrate to at different seasons of the year. To watch the Great Migration Safari, you will travel to locations where the herd is located in the Serengeti, a UNESCO World Heritage Site, when you visit.